Winter Wonderland Special… Buy 1 Night, Get 50% Off the Second Night! Stay for 2 nights consecutive nights between October 15, 2018 and May 11, 2019 and get the second night 50% off. New Reservations Only. Must purchase 2 consecutive nights, pay full price for first night, discount applies to less expensive night. Cannot be combined with any other specials or discounts, subject to availability. Limit 1 discount per reservation. Stay 3 consecutive nights between November 1 and May 24 and get the least expensive night free. Any 7+ night stay between November 1 and May 15 is eligible for a 50% discount on your entire stay! Give the gift of relaxation. Give the gift of a stay at Streamside. Gift certificates are available in multiples of $50! Really want to make it a special gift? Add a massage, gift basket or restaurant gift certificate. Gift certificates can be sent to the purchaser or directly to the recipient. Each certificate will be enclosed in an envelope. 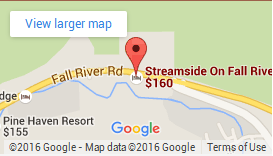 For more details or to purchase a gift certificate call the Streamside Front Desk at (970) 586-6464.